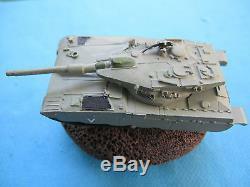 DIECAST - MERKAVA TANK DISPLAY! COMES WITH AN ORIGINAL GOLAN HEIGHTS ROCK. 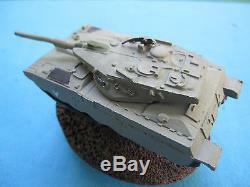 TANK MATERIAL & COLORS - GRAY DIECAST, BLACK WHEELS WITH TRACK COVERS & WHITE. SIGNS - V OF THE ARMORED BRIGADE, ON EACH SIDE. ROCK MATERIAL & COLOR - DARK BROWN GOLAN HEIGHTS BASLAT ROCK. MEASUREMENT : HEIGHT - 2 4/8 inches. WIDTH - 2 6/8 inches. WEIGHT - 375 gram ; 827 pound. 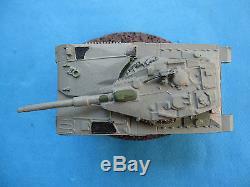 THE MERKAVA TANK HAS THE ALL DISPLAY ARMS, TOOLS, TANK TURRET, CANNON, SPRINGS. 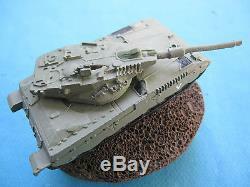 UNIQUE, AMAZING & RARE MERKAVA TANK DISPLAY OF THE I. 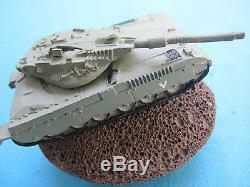 The item "ISRAEL IDF ARMY- DiECAST MERKAVA TANK DISPLAY With GOLAN HEIGHTS BASALT ROCK! NEW" is in sale since Monday, May 30, 2016. 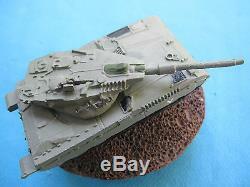 This item is in the category "Collectibles\Militaria\Other Militaria". The seller is "bgy2010" and is located in Nes Ziona. This item can be shipped worldwide.